My first book, Enlightenment's Frontier: the Scottish Highlands and the Origins of Environmentalism (Yale, 2013) investigates the environmental roots of the Scottish Enlightenment. What was the place of the natural world in Adam Smith's famous defense of free trade? This perspective recovers the forgotten networks of improvers and natural historians that sought to transform the soil, plants, and climate of Scotland in the eighteenth century. The Highlands offered a vast outdoor laboratory for rival liberal and conservative views of nature and society. But when the improvement schemes foundered toward the end of the century, northern Scotland instead became a crucible for anxieties about overpopulation, resource exhaustion, and the physical limits to economic growth. In this way, the rise and fall of the Enlightenment in the Highlands sheds new light on the origins of environmentalism. 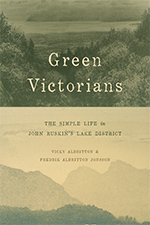 My second book, Green Victorians: The Simple Life in John Ruskin's Lake District (Chicago, 2016), coauthored with Vicky Albritton, considers the problem of the Anthropocene from the perspective of a late Victorian utopian movement. Green Victorians tells the story of the first "post-carbon" society in Britain, a community in the English Lake District dedicated to Arts and Crafts industry and simple living. This experiment was galvanized by precocious anxieties about anthropogenic climate change, voiced by the eccentric polymath John Ruskin. He convinced his supporters to reject coal and steam in favor of renewable energy and labor-intensive handicraft production. By creating a new culture of sufficiency, Ruskin and his followers sought to demonstrate that a simple material life was still compatible with a great measure of cultural creativity and intellectual freedom. Green Victorians explores the radical and material experience of Ruskin's community without shying away from the darker side of the movement, including its technophobia and paternalism. My third project, "Cornucopia and the Stationary Future: The End of Growth in the Age of Industry," will focus on the history of the stationary state and the rise of cornucopianism in Britain between Adam Smith and William Stanley Jevons. It begins with the puzzle of why leading political economists worried about environmental limits to economic growth in the midst of the Industrial Revolution. A major aim here is to offer a broad political, intellectual, and environmental explanation for this pessimism, including (1) the rise of prediction based on national statistics as a tool of governance, (2) the use of natural history and particularly geology to define the temporal horizon and environmental assumptions of political economy, and (3) the frequency and visibility of environmental strains in the metropole. The other aim of this project is to explain the origin and triumph of a rival cornucopian ideology in the nineteenth century. Why and when did Victorians eventually overcome their anxiety about the finite supply of land and embrace a new faith in indefinite growth? Here too, my model is multicausal and looks to several converging trends: (1) the rejection of land as an analytical category by marginalist economists, (2) the development of "grassroots" cornucopianism among middle-class consumers who became increasingly detached from basic processes of production and extraction, and (3) the rise of free trade populism toward the end of the nineteenth century. My research has been funded by fellowships from the Institute of Historical Research in London, the Andrew W. Mellon Foundation, the Huntington Library in Los Angeles, and the American Council for Learned Societies. I welcome graduate students in British history with a special focus on political economy, natural history, and environmental history. Past and present dissertation projects include the introduction of mixed husbandry in the settler colonies, the popularization of classical political economy, and the natural history of insects. "Abundance and Scarcity in Geological Time 1784–1844." In Nature, Action and the Future: Political Thought and the Environment, edited by Katrina Forester and Sophie Smith. Cambridge: University of Cambridge Press, forthcoming. Scales of Scarcity in the Modern World, 1800–2075, editor with John Brewer, Neil Froman, and Frank Trentmann. London: Bloomsbury Press, forthcoming. "Political Economy." In Historicism and the Human Sciences in Victorian Britain, edited by Mark Bevir, 154–85. Cambridge: Cambridge University Press, 2017. Coauthor with Vicky Albritton. Green Victorians: The Simple Life in John Ruskin's Lake District. Chicago: University of Chicago Press, 2016. "Adam Smith and Enlightenment Studies." In Adam Smith: His Life, Thought, and Legacy, edited by Ryan Patrick Hanley, 443–60. Princeton, NJ: Princeton University Press, 2016. "Island, Nation, Planet: Malthus and the Enlightenment." In New Perspectives on Malthus, edited by Robert J. Mayhew, 128–54. Cambridge: Cambridge University Press, 2016. "Climate Change and the Retreat of the Atlantic: The Cameralist Context of Pehr Kalm's Voyage to North America 1748–51" William and Mary Quarterly 72, no. 1 (Jan. 2015). "The Origins of Cornucopianism: A Preliminary Genealogy." Critical Historical Studies 1, no. 1 (Spr. 2014). Enlightenment's Frontier: The Scottish Highlands and the Origins of Environmentalism. New Haven, CT: Yale University Press, 2013. "Adam Smith in the Forest." In The Social Lives of the Forests, edited by Susanna B. Hecht, Kathleen D. Morrison, and Christine Padoch. Chicago: University of Chicago Press, 2013. "Natural History and Improvement: The Case of Tobacco." In Mercantilism Reimagined: Political Economy in Early Modern Britain and Its Empire, edited by Philip J. Stern and Carl Wennerlind. Oxford: Oxford University Press, 2013. "A History of the Species?" Review essay of Deep History: The Architecture of Past and Present, edited by Andrew Shyrock and Daniel Lord Smail, History and Theory 52, no. 3 (Oct. 2013). "The Industrial Revolution in the Anthropocene." Journal of Modern History 83, no. 3 (Sept. 2012). "Rival Ecologies of Global Commerce: Adam Smith and the Natural Historians." American Historical Review 115, no. 5 (Dec. 2010). "Prudence and Magnanimity: Roundtable on Ryan Hanley's Adam Smith and the Character of Virtue." The Art of Theory: Conversations in Political Philosophy (Nov. 2010). "Enlightened Hands: Managing Dexterity in British Medicine and Manufactures 1760–1800." In Body Parts: Critical Explorations in Corporeality, edited by Christopher Forth and Ivan Crozier. Lanham, MD: Lexington Books, 2005. "The Physiology of Hypochondria in Eighteenth-Century Britain." In Cultures of the Abdomen: Dietetics, Digestion, and Fat in the Modern World, edited by Christopher E. Forth and Ana Cardin-Coyne. Palgrave Macmillan, 2005. —Discusses Amitav Ghosh’s recent book, The Great Derangement: Climate Change and the Unthinkable, in an article in the Guardian.